Another visit from Angus and Clive, another veganish meal required! This time I turned to Ottolenghi’s Plenty More – inspired by the choice of that excellent volume for the recent gathering of the Muswell Hill Occasional Cook Book Club (more about that in another post soon). Preheat the oven to 200C/180F/gas mark 4. Place cauliflower in a saucepan and add a teaspoon of salt. Cover with water and simmer for 15 minutes. Drain and set aside to dry. Cut four round slices, about 0.5 cm thick, off one end of the onion and set aside. Roughly chop the rest of the onion and place in a small pan with the olive oil and rosemary. Cook for 10 minutes on a medium heat, stirring from time to time until soft. Set aside to cool. 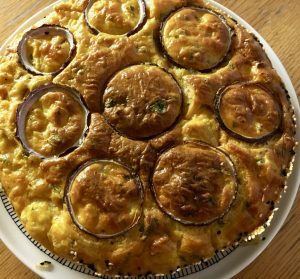 Transfer the cooked onion to a large bowl, add the eggs and basil, whisk well then add the flour, baking powder, turmeric, cheese, 1 teaspoon of salon and plenty of black pepper. Whisk until smooth then add the cauliflower, stirring gently. Line the base and sides of a 24 cm springform cake tin (I used 23cm), lined with baking parchment. Brush the sides with melted butter, mixed together the sesame and nigella seeds. Toss them around the tin so they stick to the sides. Tip in the cauliflower mix and arrange the onion rings on top . Place in the centre of the oven and bake for 45 minutes (I’m glad I checked after 30 – it was more or less done, but that’s probably more about my slightly dodgy oven rather than the recipe). It should be golden brown and a skewer inserted in the middle should come out clean. Remove from the oven and leave for at least 20 minutes before serving. Heavenly – like a sophisticated cauliflower cheese, but in cake form. I served this with a Spring Salad, also from Plenty More. 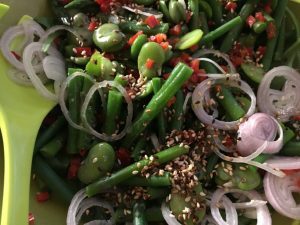 Lots of tasty vegetables (I even managed to get Missy B to pod the broad beans for me – if you’ll forgive me a Proustian moment, it was just like I used to love doing with my grandmothers). Just a simple dressing of sesame oil, olive oil and lemon juice, with a gentle kick from some red chilli. Dessert was these juicy figs – roasted with pomegranate molasses and orange zest. Again with thanks to Mr Ottolenghi. So glad I happened to be passing the excellent Pomona deli in Belize Park the day before, as they had just six of the most delicious ripe figs left. I know lots of people who are ambivalent about figs, but really, give these a try. Cut the figs in half and leave them to marinate for half an hour in: 3 tbsp pomegranate molasses, 1 tbsp lemon juice, 1 tbsp dark muscovado sugar, two stalks of thyme, 1 tbsp water and a long strip of rind from an orange. Mix 100g each of mascarpone and Greek yogurt with 1 tbsp of icing sugar – this is DIVINE. Any dinner guests will henceforth be presented with this whenever there is a fruit-based dessert on offer at Battenburg Towers. When you are ready, remove the figs from the marinade and place them in a shallow ovenproof dish and sprinkle with 2 tbsp dark muscovado sugar and place under hot grill for around 10 minutes (keep an eye on them) – the sugar should be caramelised. Bring the marinade to the boil for a couple of minutes. 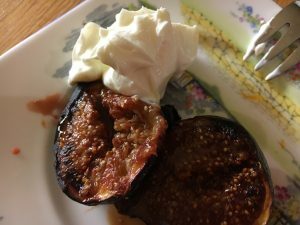 Serve the figs with a little of the sauce reduction, a few thyme leaves, a sprinkling of orange zest and a generous helping of the yogurt cream. It was a lovely evening and my guests went home happy, with a portion of cauliflower cake each for their dinner the next day. And I resisted finishing all the yogurt cream while I wafted round the kitchen tidying up. Mmmmm – yes to the cauliflower cake – that sounds ace. And congrats on the willpower! !